First let us see how to use the monitoring data part using MDT, I won't explain how to configure the monitoring part but just how to use it with PowerShell for our examples. 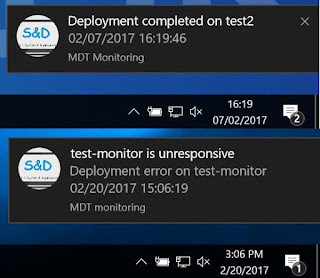 The deployment notification can be used on any Windows 10 computers, no need tu run it on the MDT Server The only pre-requisite is that Monitoring has to be enable on the MDT server. In the example below, I ran the notification script on the left computer. Note: MDT server is not installed on that computer, you can consider it as a client. Thre right computer is being installed using MDT. Percent complete indicates the deployment progression percentage. StepName indicates the current step of your Deployment, for instance below. In the example below, we will see how to display a notification on your computer when a specific ciomputer has been successfully installed. In the example below, we will see how to display a notifications when a specific computer is being installed and show its progression with percentage and step name. At each step of the deployment, for instance Format and Partition, Inject drivers, Install OS, a notification will be displayed. In the example below we will see how to display a notification when an error occurs during the deployment of a specific computer. Error are catched using the DeploymentStatus parameter. In the example below, we will see how to display a notification for the main deployment steps. Of course you can choose your own steps by choosing yours in your Task Sequence. You can download these samples scripts on Technet, below button. You can of course ask just one parameter, computer name and store all others in an XML file, as these parameters will be mostly common. 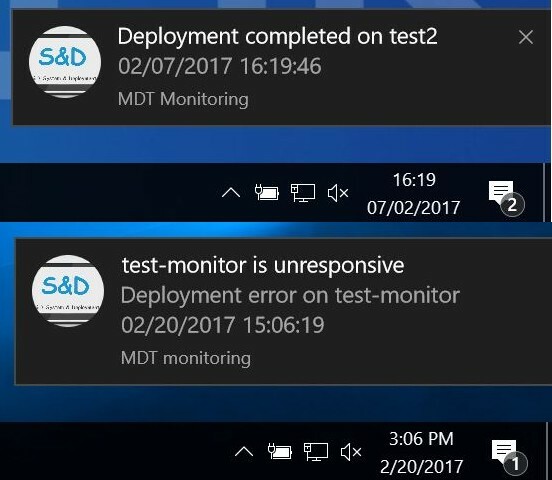 So far we have seen how to display a notification and warning when a deployment is completed on a specific computer and when error occurs. Why not using this part to check multiple computers deployment ? In my next post I will show that. I have a little question... Which computer received the notification ? The MDT server ? It's possible to display this notification to a remote workstation to monit the deployment ? Thanks for your answer and this excellent article ! you can use it on the server but in my case i run it on another computer. This computer should have Windows 10 installed to run the module. MDT is not needed on that computer you can load a light module of mdt i created in a previous post. You mention a post about checking multiple computers. Have you done that yet? If so, can you post a link? I would love to monitor more than one computer status at a time.